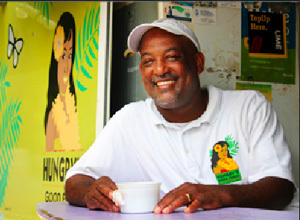 Hungry's has been in business since 2004, and is owned & operated by business partners Irad Gumbs and Alfonzo (Papi) Hodge. 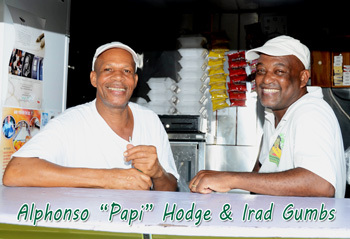 Irad & Papi have worked together in other Anguillian restaurants since the late 1990's. 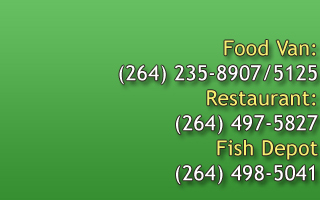 In 2003 they started their own catering business, which led to opening their own restaurant. With the goal of providing the highest quality food, for on-the-go customers, at an affordable price, "Hungry's Good Food" was born! The Hungry's menu has eight varieties of home-made soup, five fresh salads, twelve scrumptious quesadillas, and nine mouthwatering pasta dishes, along with local juices, soft drinks & a full bar. Their unique menu appeals to locals & visitors alike, and their "Good Food" is always fast, fresh & delicious!! "Located in the Valley, the island's [Anguilla's] administrative center, this restaurant serves fresh fish and lobster quesadillas stuffed with garlicky vegetables and melted Gouda in a painted truck that resembles Scooby Doo's Mystery Machine. And it has the cheapest Heineken you'll find anywhere." © 2013 Hungry's Good Food. All rights reserved.